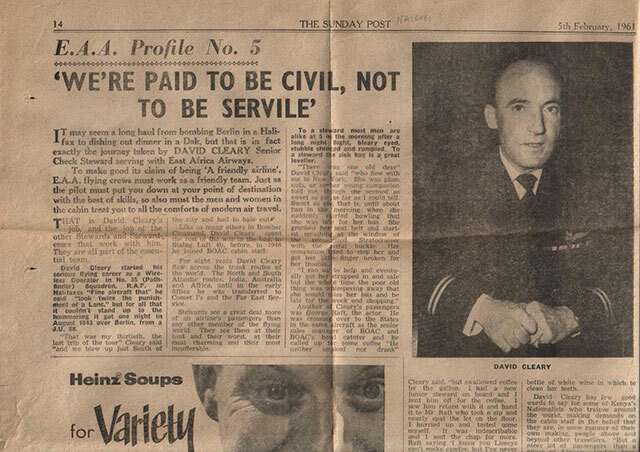 It may seem a long haul from bombing Berlin in a Halifax to dishing out dinner in a Dsk, but that is in fact the journey taken by David Cleary Senior Check Steward serving with East Africa Airways. To make good its claim of being ‘a friendly airline’, EAA flying crews must work as a friendly team. Just as the pilot must put you down at your point of destination with the best of skills, so also must the men and women in the cabin treat you to all the comforts of modern air travel. That is David Cleary’s job, and the job of the other stewards and stewardesses that work with him. They are all part of the essential team. David Cleary started his serious flying career as a Wireless Operator in No. 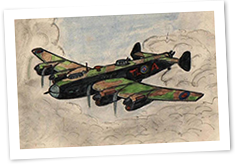 35 (Pathfinder) Squadron RAF in the Halifaxes “Fine aircraft that” he said “took twice the punishment of a Lanc” but for all that it couldn’t stand up to the hammering it got one night in August 1943 over Berlin, from a JU 88. 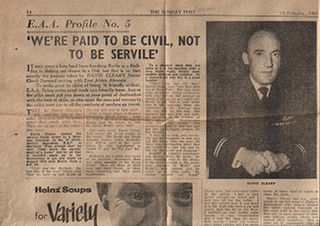 Like so many others in Bomber Command, David Cleary spent the rest of the war in the bag, in Stalag Luft 4b, before, in 1946 he joined BOAC cabin staff. For eight years David flew across the trunk routes of the world. The North and South Atlantic routes, India, Australia, and Africa, until in the early fifties he was transferred to Comet J’s and the Far East Service. Stewards see a great deal more of an airline’s passengers than any other member of the flying world. They see them at their best and their worst, at their most charming and their most insufferable. To a steward most men are alike at 5 in the morning after a long night flight, bleary eyed, stubble chinned and rumpled. To the steward the sick bag is a great leveller. “There was one old dear” David Cleary said “who flew with me to New York. She was plum nuts, or so her young companion told me, though she seemed as sweet as pie as far as I could tell. Sweet as pie, that is, until about two in the morning when she started howling that she was late for her bus. She grabbed her seat belt and started smashing at the window of the pressurised Stratocruiser with the metal buckle. Her companion tried to stop her and got her little finger broken for her trouble.